This leading EDA software developer is focused on helping customers build great products that connect the world. When it discovered its software was being pirated, it began looking for solutions to stop the piracy. The company had suspected for a long time that its software was being pirated so four years ago a pilot program was started in which anti-piracy technology was integrated into one of the smaller software product lines. The technology validated the assumption that piracy was very pervasive in terms of the volume of software licenses being stolen. This pilot program also provided clear proof that other product lines were being pirated as well. Subsequently, the compliance team tried to develop some models that would help estimate the potential monetary value of product being lost to piracy and the potential for recovery if it was to embark on a license compliance program. It was decided that the volume of piracy was a clear indicator that would warrant action. In terms of modeling a license program, there were several factors to consider, including the sensitivities involved with some of the infringing organizations who were customers, as well as company cultures, and, finally, how aggressive the compliance team wanted to be about their findings. The company always had a very clear mandate from management regarding the importance of compliance so they wanted to take every step possible to ensure that their IP was protected. It was also very important to them to help their customers achieve compliance. This helped set the tone for the license program because there was a lot of infringement that the team did not believe was by design. Today, everyone operates in a globally intertwined world where organizations are spread over multiple countries and regions in terms of how the supply chain is leveraged, therefore it’s very hard to manage and monitor who has what software on which computer and to address attitudes about personal liberty. This is a very difficult problem to tackle. There wasn’t a formal compliance program before the company embarked on its project with SmartFlow. Other technologies were used that would help identify and track infringing information, but they were a part of the initial pilot program. When the company decided to invest in SmartFlow, it got serious about a formal compliance program. 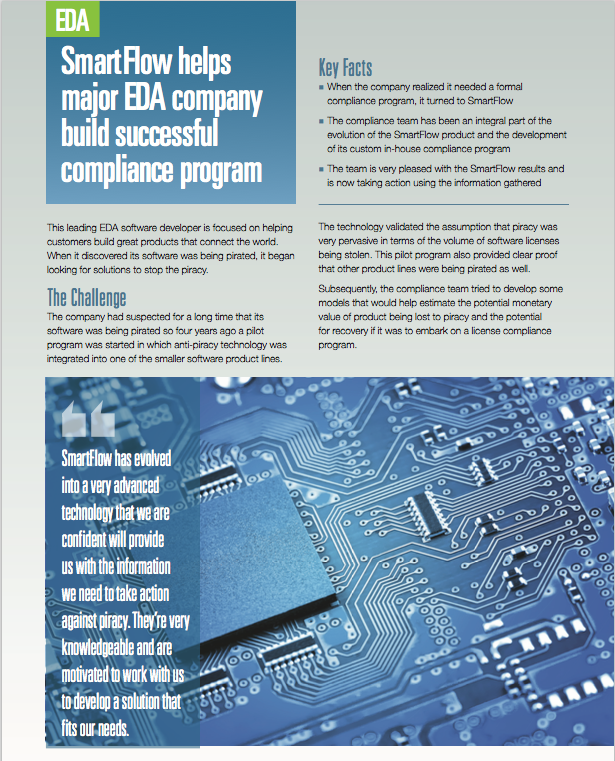 The EDA company chose SmartFlow because of its advanced technology that provides the ability to very accurately pinpoint misuse of applications and deliver the details needed to prevail in a demand negotiation or lawsuit. The case management system, state-of-the-art matching algorithms, and comprehensive business intelligence and reporting capabilities are invaluable tools. The SmartFlow people are extremely knowledgeable and work well with the compliance team to customize a solution that fits the EDA company’s specific needs.